z1/z2 are measurements of two variables, which can be put into separate layers, i.e. layer 1 takes z1 values, and layer 2 takes z2 values. The two layers use the the same grid system. Empty cells can be assigned with 0 or NA. # use 'dist' to create a matrix of Euclidean distances between points. The interesting thing about using the min distance between any 2 points as the cell diagonal, and not the resolution, is the effect it has on cell size. The cell diagonal is always 41.4% bigger than the side resolution so you shrink the cell size quite significantly (by exactly half in terms of area), which is quite a lot. Just as a quirk of the extent + resolution, the cell size is now not big enough to guarantee all points are in their own cell, due to the fact min distance has been used as the resolution. I have to admit when i ran the 2nd example a number of times with a greater number of random points etc, i don't think i ever saw this theoretical outcome reproduced but the point is, it can occur. So it is better to use the 1st approach. 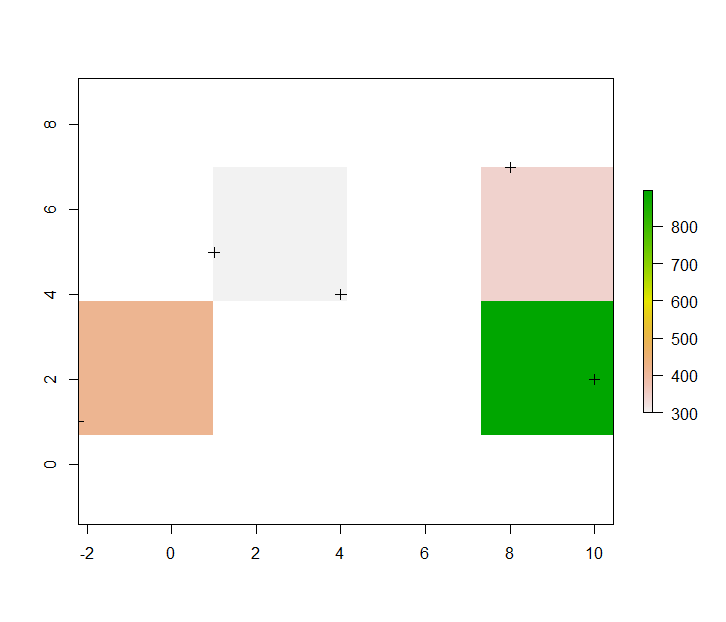 Joining grid or polygon layers in R?